Matar has been making his patron-favorite baba ganoush recipe for more than 15 years, and he says his secret is his special tahini. Recipe adapted from Riad Matar of Riad’s Mediterranean Dining. Editor’s Note: Matar has been making his patron-favorite baba ganoush recipe for more than 15 years, and he says his secret is his special tahini. He claims his baba ganoush is better than what he gets when he visits his mother in Dubai. Matar guards his recipe closely, but we got him to tell us how to replicate it at home. He didn’t divulge amounts of ingredients, so grab a tasting spoon and play it by ear as you cook. Using a bamboo shish kebab skewer, pierce your eggplants all over. This step is key so that your whole eggplants don’t explode on you as you heat them up. Leave them whole, uncut, to keep the eggplants from drying out. Place your whole, pierced eggplants on a rimmed baking sheet, then place the baking sheet on a grill over high heat (about 450ºF). Grill the eggplants until the skin is blistered and charred and the insides are soft. The eggplants will leak juices that resemble a tar, and the baking sheet will catch those juices. Do not discard. Set the baking sheet aside to cool to room temperature. Once cooled, peel the skin off the eggplant and chop off and discard the stem. Roughly chop the eggplant then place in a food processor along with the juices, garlic, the juice of a lemon, a sprinkle (about a teaspoon) of sea salt and tahini. Process on low to combine. 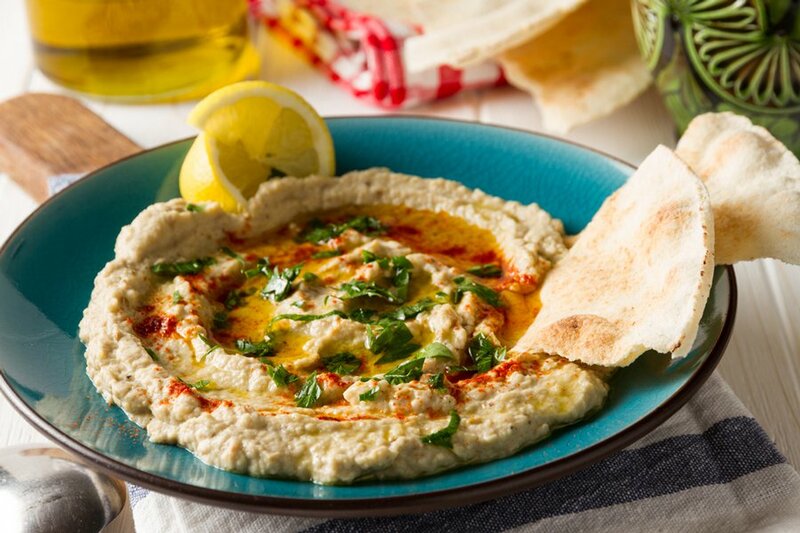 The tahini will thicken the baba ganoush, so if it’s too thin, add more tahini, and if it’s too thick, add water one tablespoon at a time until you reach your desired consistency. Chill before serving. Mixture will thicken in the fridge. Drizzle the top with a small amount of oil and serve with warm pita, or, if you are going low-carb, with cucumber, fresh red cabbage, tomato and lettuce.